Vehicle wraps and graphics create a mobile billboard for your business. Take advantage of the unique mobile opportunity to brand your business. Adhesive graphics are an amazing way to create advertising space, brand your company and get your message across. The possibilities are endless with the advanced materials available in today's market when used in combination with high quality digital printing. Allow our experienced graphic designers to come up with a graphics campaign to suit all of your advertising and/or branding needs. Whether you want a full wrap, a partial wrap or decals and lettering with your branding, Chief SIgns can get your vehicle turned around in no time. 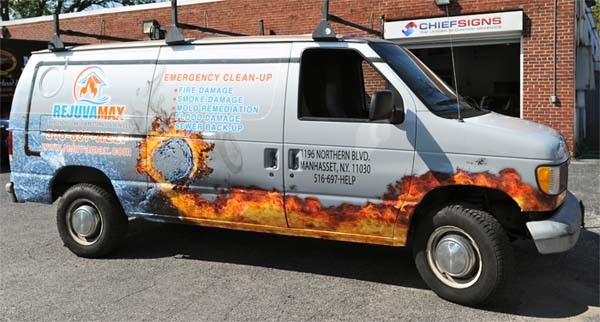 In Port Washington, NY and all of Long Island, Vehicle Wraps and Custom Graphics are one of the most effective ways to get your point across. For all of your Custom Graphic needs, come to Chief Signs.